For nearly 100 years, Gucci has affirmed its brand position through its excellent quality and prestige all over the world. In the world of luxury goods, Gucci always stays on top of the list whether you talk about clothing, bags, jewelry or Gucci mens wallet. 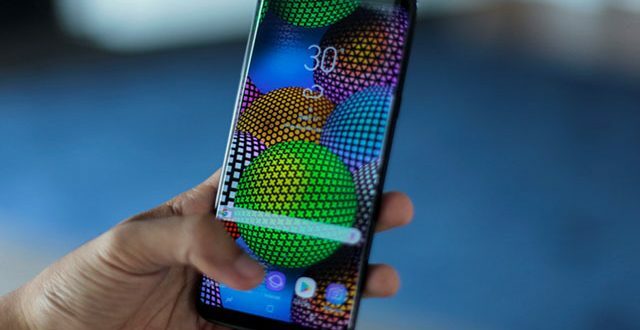 Therefore, there is no surprise when you see replicas product everywhere in the market, which makes it more difficult to distinguish between the real and the fake one. Besides wallets for women, Gucci also creates an impression with product for the gentlemen. Most Gucci mens wallet embraces the masculine design, excellent performance to meet all the demands. One bonus point for most gents wallet and Gucci purse sale is the variety of pattern and materials. Each of them features the uniqueness and characteristics that match your personal fashion taste. What is Gucci mens wallet made of? Among several designs to choose from, Gucci mens wallet always grabs customers attention by utilizing different fabric types. 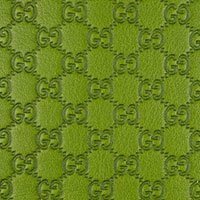 If you are a fan of this brand, we will go into detail about all Gucci fabrics and textiles you may have seen before. The most common fabrics include GG canvas, Guccissima leather, Diamante, and Flora. 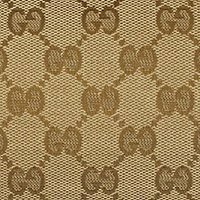 Founded since the mid-1960s, Gucci GG Canvas embraces the diamond symbol, which became a dominant pattern throughout all trends and seasons. Feature the combination of premium canvas and leather trim, Gucci Mens Wallet GG is highly recommended by most people thanks to its perfect craftsmanship. Created in the 1950’s in red and green, this fabric design took inspiration from a saddle girth. For people who haven’t known, the saddle girth is also one equipment that keeps the saddle stay in its place (also called as a “web”). Not just the Gucci wallet, the brand has taken advantage of this fabric stripe in different material and color tones. In Italian, Guccissima literally means “the most Gucci”. 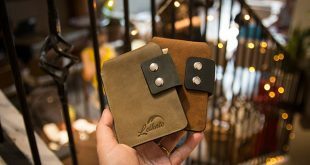 It may sound funny; however, the brand wants to emphasize the quality and the class you will experience when using any wallets. The most famous Gucci Mens Wallet Guccissima was crafted in 2006, which features the GG logo embossed at the front. For all classic lover, this is one mini version of the Guccissima. You will find this motif in most recent accessories as well as the classic one. 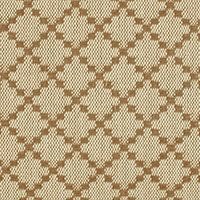 Originally appeared in the mid-1930s, the Gucci Diamante pattern was first woven onto hemp. 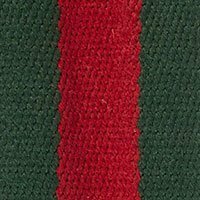 From the beginning of wartime, this pattern came up as an innovative idea to deal with design shortage. 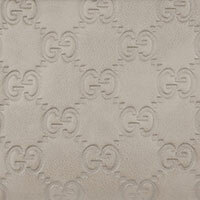 Now, Gucci leverages this motif by using it on textured leather and premium canvas. Inspired by a personal request in the past, this motif was made in silk print for the Monaco princess. 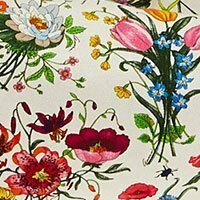 Although this pattern is not well-received by critics, Gucci Flora pattern finds it easier to grab attention from teenager and women. These days, the flora pattern is used not only on wallet, but also footwear, bags and small leather stuff. Where to buy Gucci mens wallet? As Gucci operates more than 500 official stores throughout the world, it would be easier for you to buy your interested items. If you have a local residence in one of those places Gucci offers, then they can ship it to your address. Otherwise, purchasing Gucci mens wallet, clothes and other accessories from online websites is also a great idea. However, you need to read the comment and reviews carefully before clicking “Add to Cart”. Always surprise us with the unexpected items, Kingsnake print GG Supreme takes advantage of the signature kingsnake motif – the symbol of wisdom and power. This legless reptile started dominant the whole fashion industry and will grab your attention from the very first time. Made of premium canvas in black/gray color, Gucci mens wallet brings you the smooth experience and remains its original shape from any outer impacts. In term of sizing, this Gucci zip around wallet measures 7.5 x 4 x 1 inches (W – H – D). Take a closer look, there are 12 card slots and 1 zipper pocket for coins and other important stuff. All your belongings will be secured thanks to the zip around closure. 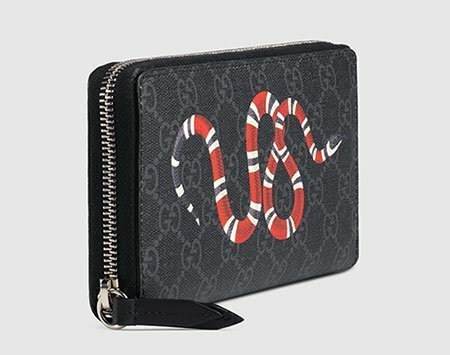 Gucci kingsnake wallet also brings the intense harmony in design by utilizing the leather trim and black palladium-toned hardware. You can choose between the black and beige/ebony skin with Kingsnake print on it. Since Gucci mens wallet is made in Italy, the brand guarantees for good quality and professional craftsmanship. For each new season, Gucci mens wallet collection always impresses their customers with new prints and motifs. Not using the embroidery method, the brand chooses to print animal images to create a three dimensional effect. 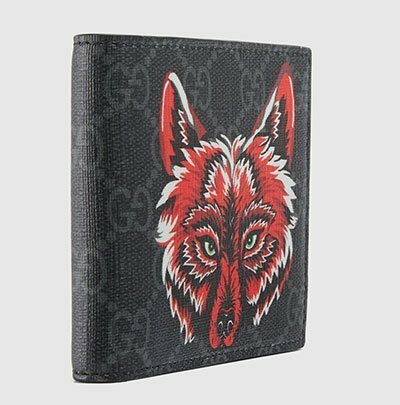 This GG Supreme Gucci Mens Wallet with Wolf Print delivers the strength, class and intelligence that gets you stand out among the crowd. Made of canvas material, Gucci gents wallet delivers the softness but still keeps wallet stay firmly on your hand thanks to the rough outer skin. 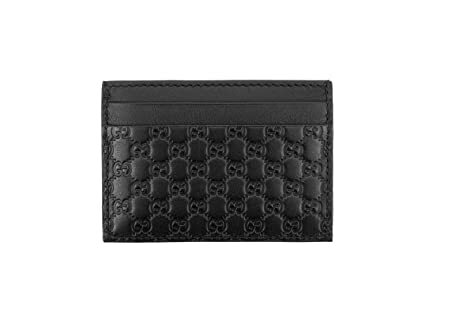 Feature the bifold design, this black Gucci wallet measures 4.5 x 3.5 inches when being closed. (W – H). The inner construction of this Gucci purse sale is covered with one layer of moiré lining. It enhances the smooth touch as well as the masculine look, especially when you combine with a suit on special occasions. There are 8 card slots and 2 full-length compartments for banknotes, important papers. In western culture, red and black are the two common colors for designers when they want to create a huge impression towards customers. Gucci mens wallet has been successful when combining these striking colors, which delivers the strong sense of power. Besides the wolf print, you can select your favorite one among the tiger, kingsnake and bee images. 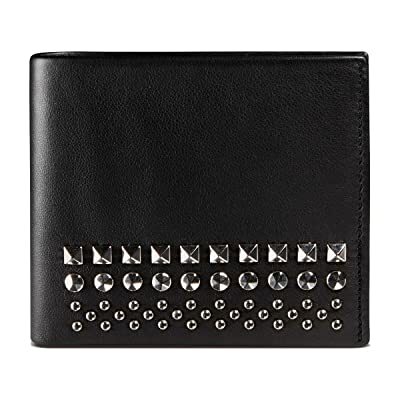 Check out one more design of Gucci mens wallet – the Men’s Studded Leather Bi-fold. Made in Italy, this item ensures to meet your needs, even the pickiest customers with premium quality and excellent craftsmanship. Different from the above products, the bifold studded wallet for men takes advantage of genuine leather. Leather is one common material which stays in the top-list as it delivers intense durability and does not require much maintenance. This black Gucci wallet takes advantage of the sleek jet black color, which both emphasizes the professional design as well as rebellious spirit. One element that will get you fall in love with this is the decorative studs at the front, which helps adding an extra bit of flair. Take a look inside, you will have 1 full-length compartment, 2 hidden pockets and up to 8 card slots. When purchasing this Gucci mens wallet, be sure to check for its authenticity cards, serial number to make sure you purchase the real one. Men don’t be afraid to try something new this summer by start wearing the floral pattern. If you want something subtle, pick one plain T-shirt with a floral Gucci mens wallet. This XL Embossed Black Gucci Wallet is one imported item, it ensures to meet all the strict requirements in quality and craftsmanship. Wonder about the size? XL Gucci purse sale measures approximately 7.5 x 4 x 0.75 inches. You can choose to carry on hands or put inside hand bags, purse. 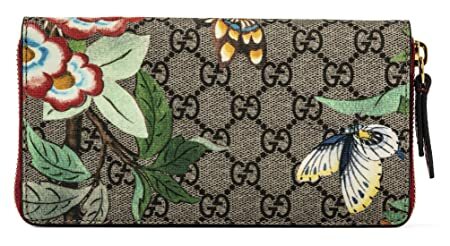 This Gucci wallet takes advantage of floral motif, which includes flowers, insects, hummingbirds and butterflies. The brand uses canvas as the main material as it delivers the smoothness in using as well as the artistic spirit. We believe you will be amazed when seeing the perfect combination of brushstroke-style graphics and 3D printed. The inner construction features 12 card slots, 3 bill compartments and 1 zipper coin pocket. All slots are secured by one zipper closure with gold-tone hardware. Gucci mens wallet features the leather trim along the edges to prevent tears or wear out due to carelessness. You guys always get familiar with the small purse that stays in the palm of your hand. However, street style stars suggest that we should not fill our bag to the brim. Rather, keep it light and dangle it nonchalantly by your side. Then, this Leather Gucci Mens Pouch with Metal Logo needs to stay on top of the list. In term of size, Gucci mens wallet measures 11 x 8.5 x 1.5 inches (W – L – H). Made of genuine leather, the black Gucci wallet delivers long-lasted lifespan and excellent performance from the very first touch. The inner design is covered with one layer of black moire lining, which emphasizes the elegant feeling. You will have 6 inner card slots and 1 open pocket. Feel free to leave your essentials inside; however, try to limit the number of items you keep inside. Tired of carrying for the whole day? Let’s take turn to wear it on your wrist with the strap measures 4.5 inches. Make sure to check for the golden Gucci logo to make sure its authenticity. But if you purchase from Gucci official page, then no need to do this. Zipper closure utilizes the golden metal hardware which prevents it from getting rusty after a hard time. For each wallet collection, we always try to recommend different design of wallet. This not only offers you wider options, but also helps you in choosing the most suitable one. 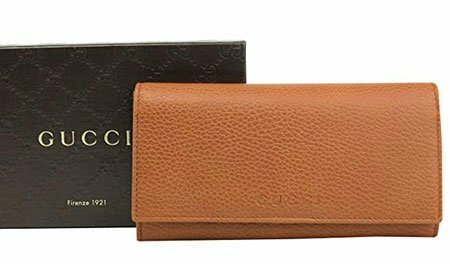 Made of 100% genuine leather in Italy, Continental Dark Orange Leather Gucci Mens Wallet delivers the intense durability no matter how hard you use. This gents wallet outer skin features the pebbled layer, which helps keep wallet stay firmly on the palm of your hands. Kindly measures your banknote and belongings to make sure they fit the Gucci long wallet for men above. Its size measures roughly 7 4/8 x 4 x 6/8 inches (L – H – W). Take a look inside, you will have 2 full-length money compartments, 5 slip pockets and 13 card slots. If you are into cards, then this one should stay on top of the list as it features roomy space and smart layout; allow you to grab your cards in a few seconds. There is 1 extra zipper pocket in case you wanna leave your coins, key or tiny stuff with the best protection. All the slots and compartments are secured by one strong button closure. However, be aware that it would be hard to close the closure once you put inside too many things. Gucci mens wallet in long construction comes along with tags, full-box and authenticity cards included. 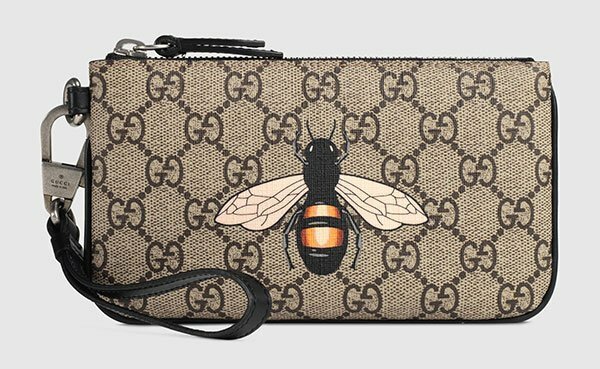 Instead of normal design or Gucci card case, it is necessary to have one pouch so you can carry more things such as keys, lipstick .. With this Bee print GG Supreme pouch, you now have one accessory which is both fashionable and roomy to carry lots of things. Made of premium canvas in black/gray color, Gucci mens wallet brings you the smooth experience and remains its original shape from any outer impacts. In term of sizing, this Gucci purse sale measures 7 x 4.5 inches (W – H). Take a closer look, there are 2 card slots for coins and other important stuff. All your belongings will be secured thanks to the zip around closure. Gucci kingsnake wallet also brings the intense harmony in design by utilizing the leather trim and black palladium-toned hardware. Not just money and card, feel free to carry your smartphone without a burden (it fits iPhone 8 Plus, iPhone X/ XS). While the bee version is available in beige Gucci mens wallet, you can choose the black one with the Kingsnake print. All gents wallet edges are covered with leather trim, which limits the risk of tears or wears due to carelessness. To bring the subtle and fashionable look, punk design and sparkle studs will make a cool addition to any outfits. Especially, it keeps you at the forefront of fashion trend. Instead of emphasizing this trend on clothes, Gucci chooses to reflect the unique style on their Gucci mens wallet collection. Made of genuine leather, wallet ensures to adapt all strict requirements in quality and craftsmanship. So, you can buy this Leather Gucci Mens wallet with Double G for yourself or give it as a gift on special holiday as well. In term of size, this Gucci mens wallet measures 4.5 x 3.5 inches (W – H) when being closed. Feature the bifold construction, you will have 2 bill compartments and 8 card slots. One precise element that will grab most attention is the design of silver and gold-toned studs surrounding the Double G detail. No matter which occasions you are heading to, an event, daily office days or a short hangout with friends, this Double G Gucci Wallet will add a bit of flair to your appearance. Founded in Florence in 1921, Gucci is known as the world’s leading luxury fashion brands, with a renowned reputation for creativity. For every item you purchase from this brand, we sure you will experience an innovation and perfect Italian craftsmanship. Most businessman will fall in love with this Microguccissima Signature Gucci Card Case Wallet. Made of signature leather, gents wallet delivers the long-lasted lifespan as well as excellent craftsmanship. Please kindly measure your card before purchasing to avoid the risk of inconsistency. 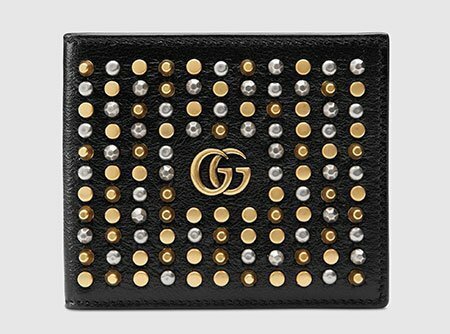 This black Gucci wallet measures 4 x 2.75 inches (W – H). You will have 1 pocket at the center for money and small receipts and 4 card slots. Commonly, businessman is more likely to choose it as you can keep things well-organized. Just grab some most-used cards for taking in and out in a few moments. Don’t forget to check the logo and stitched details to make sure its authenticity. Microguccissima Signature Gucci mens wallet comes along with one elegant box and care manual guide. This is also a bonus point if you want to purchase as a special gift for your loved one. 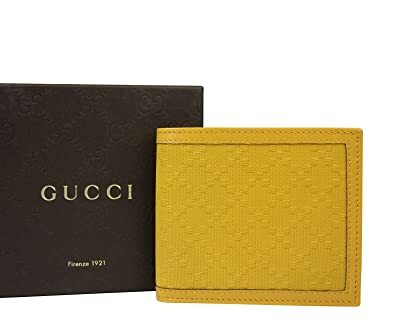 Among dark colors and stunning prints, Gucci mens wallet also takes advantage of bright tone as it would reflect the special hook for any clothing set. This Gucci Bifold Hillary Lux Yellow is made in Italy, which means it meets all the strict requirements in design and quality. Similar to the above products, Gucci utilizes genuine leather as the main material. So, you don’t have to worry as Gucci mens wallet offers the best protection to secure your essentials from any outer impacts. In term of sizing, Gucci mens wallet measures 4 2/8 x 3 5/8 x 6/8 inches. Take a closer look, the inner design features 2 full-length compartments, 2 slip pockets for important stuff and 6 card slots. The outer skins feature the rough surface, which helps keep wallet stay firmly on the palm of your hands. Gucci mens wallet in long construction comes along with tags, full-box and authenticity cards included. Gucci has been famous as one of the world fashion symbols for years. This brand continues to conquer the fashion industry with stunning accessories such as chunky Rhyton sneaker, Gucci Ghost watches, New York Yankees gear and Double G rings. With several Gucci mens wallet which inspired from Kingsnake or Bee pattern in this collection, we believe you can define your true colors no matter where you go, from the normal office day to fantastic summer party on the weekend.